The cover for the e-book. Gravity 2.0 explores the design opportunities found in a unique and evolving theory of gravity. If confirmed, it will dramatically change – and possibly save – our world. It is about the impacts of a new technology to modify gravity and how a new discipline of “gravity design” will guide new designs in transportation, architecture, medicine, sports, and possibly make our world a greener place to live. This is neither science fiction nor junk science. The peer reviewed scientific studies cited are part of a growing body of work to understand the nature of gravity and to provide answers as to why general relativity is incomplete in describing our universe. We are on the brink of another incredible expansion of technology – and gravity is at its center. 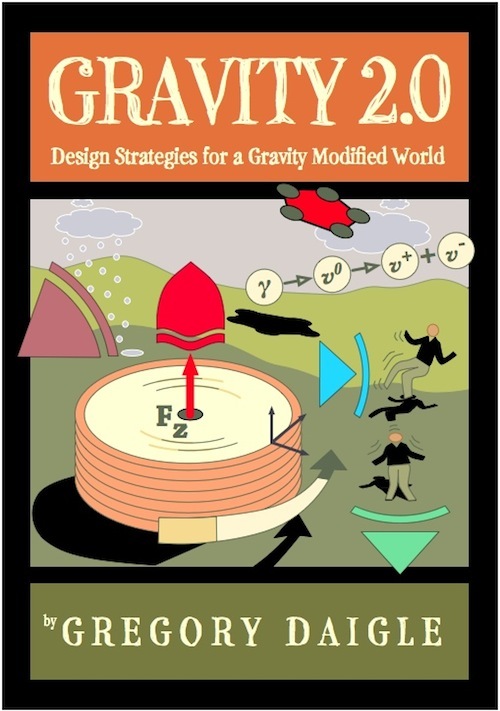 This book reviews one outlier theory of gravity modification from the mid 1950s through experiments conducted at one of Europe’s largest research laboratories conducted with the support of the European Space Agency and NASA. Written from a designer’s perspective, the book investigates recent expansions of the theory with implications for propulsion. It explores what it would take to construct field generators by employing existing magnetic and condensed matter physics, then forecasts possible future impacts. Flying cars and spaceports are only the most obvious outcomes. Also explored is how gravity modification (gMod) can improve medical care, alter manufacturing, produce remarkable architecture, change the physicality of sports, and even resist the effects of climate change. Gravity modification may not only be the answer to a more economically vibrant and game-changing future, but also the answer to generating clean and carbon free green energy. The book’s chapters are organized into three main parts: I. A New Technological Domain, II. Gravity Design Applications, and III. Cleaning our Gravity Well. Part I is an introduction to the theory and experiments behind gravity modification. The first chapter, “Gravity is Still a Puzzle”, reviews the historical attempts to escape our gravity well and how to separate bogus science from real science. “Breakthrough Programs” reviews the research and experiments conducted that led to gravity modification. “Heim Theory” addresses the historical and current developments of a leading theory explaining how “gravity-like” fields can be generated in the laboratory. “Making a Gravity Engine” addresses some of the known experiments to turn theory into practice by generating gravity-like fields. In Part II, its initial chapter “Designing a World without Gravity” discusses design approaches and philosophies for designers and architects when approaching a world-changing technology. “Where’s My Flying Car?” highlights the transportation applications of gravity modification for a daily commute a thousand feet above the ground in gravityships. “Gravitecture+” discusses incremental uses of gravity modification to structurally augment architecture, but also to make possible fantastic architectural edifices that float in the air. “Gravity Design for Products” looks at potential product applications from sports to medicine to mining, and explores how movement in three-dimensional space will impact our social interactions, demography and democracy. In Part III, “Is Gravity Green?” details forecasting the use of gravity-like fields to produce clean energy, reduce consumption of fossil fuels, sequester greenhouse gases and slow the rate of sea level change. “Industrial Spaceports” addresses clearing near-earth orbit of dangerous debris, establishing communications satellites practically anywhere in orbit and developing full industrial spaceports. Finally, “The New Gravity Meme” addresses how, like the discoveries of “perspective” and “relativity” before, new ways of thinking about gravity will change how we perceive the world around us. Written by a former professor of industrial design, this digital book contains over 330 citations to research, articles and other publications investigating this new technology domain. Gregory Daigle is an educator, project manager and technology writer. Mr. Daigle is a former Associate Professor of Industrial Design at the Minneapolis College of Art and Design and currently teaches interface and Web design as an adjunct at the University of Minnesota. He has collaborated on furniture designs produced by Herman Miller Inc., and has been a design consultant for manufacturers such as 3M, Cray Research and Stratasys. For years he worked for Bill Stumpf, an iconic industrial designer, and served as the firm’s Research Manager and as a Senior Designer. He has been a project manager and instructional designer for the e-learning industry with clients in the medical, financial and airlines industries. He co-founded ICONOS inc., a pioneering firm producing STEM learning software for children and whose productions included the “What’s the Secret?” science series for PBS and the first interactive version of Macworld Magazine. His software productions have garnered several dozen national and international awards and distinctions from the software, film and video industries. He also managed creative and production staffs for the interactive division of Bozell Kamstra, an Ad Age and Adweek Top-100 interactive advertising agency. Greg has written about science and technology innovations including such diverse topics as gravity modification, metamaterials, printable robots and digital tattoos for one of the first online news journals in Korea, OhmyNews. Some of those writings can be found at his personal site, The Unlit Pipe. He also acts as Executive Director of Digital Watershed, a non-profit engaged in developing wireless tools, place- based learning and global education for young adults. His Web site on advances in gravity research and development, “Gravity Modification”, was established in 2007. Greg currently works for Dr. Michael Allen, a leader in e-learning and co-founder of Macromedia.